Based on the numbers I have in thus far, coupled with a pretty good sense of what will come in from ebay and Paypal over the next couple of weeks, February will have been my first self-sufficient month of 2013. It won’t be by much, but it’s an accomplishment I am still very happy with none-the-less, especially since the surplus in February might just be enough to cover the tiny deficit I was left with following January’s solid start to the year. That would then put 2013 right on track for achieving my ultimate goal, the first time such a scenario has existed in a calendar since I started down this path toward the ultimate goal I have for my hobby. But there’s reason for concern as well. Nearly two-thirds of my revenue in February came from the sale of a single item. Without that sale February would have been much worse than it ended up looking on paper. I was also less strict with my purchasing habits in February than I would have liked. The “you have to spend money to make money” mindset set in on a number of occasions, which led me to making purchases for cards I intend to flip in my ebay store more frequently than was necessary. When I was lamenting my lack of progress on my hobby in a post a couple of weeks ago, one of the things I made mention of was the fact that I had barely even logged in to SCF, let alone actively pursued trades. With two months of the year now behind us, just a single trade wrapped up, and 24 more needed in order to accomplish goal #2 I set for the year, I figure its time for a refocus. Which brings me to the point of today’s article: the combination of me not being able to control my spending as well as I’d like and the fact that I’ve made no trades got me thinking of a relatively extreme solution: cut off the bank and Paypal accounts for the month and focus the energy and time I’d been using on buying on trading instead. So starting today (well actually it’ll be after I pay off one final ebay order this weekend… of Joe Sakic cards…a guy I don’t even collect…see “get unnecessary spending under control”) I will be ignoring the buying side of ebay and turning my attention to the SCF boards to make some deals. 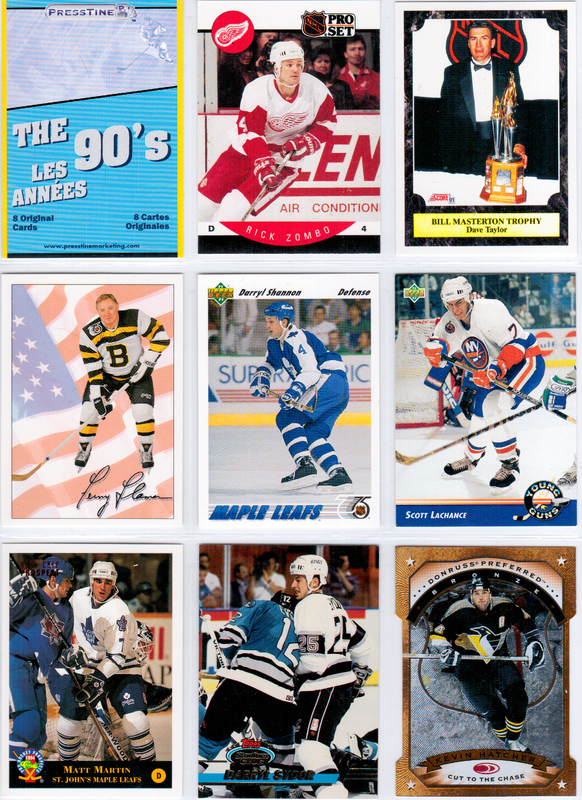 If you’ve got any cards you think I might be interested after checking out my want list and you’d like to make a deal, then let me know by posting a comment, connecting on Facebook and Twitter, or emailing me at bb_bros@hotmail.com. 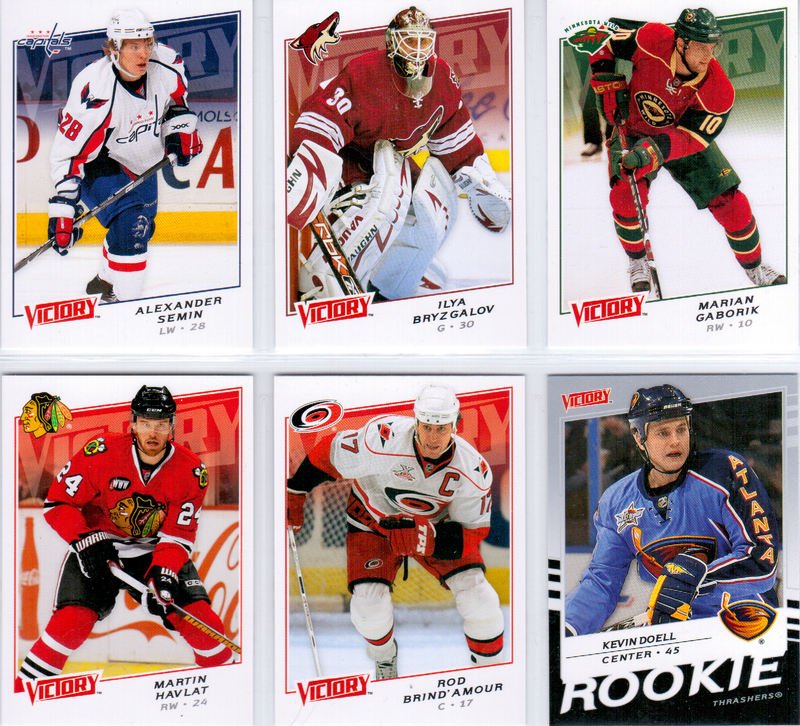 Aside from a trio of packs I picked up on Upper Deck’s National Hockey Card Day a few weeks ago, busting packs has been virtually absent from my collecting experience thus far in 2013. So when the wife and I made a trip to the dollar store a few weeks ago to pick up some party supplies for her niece’s birthday I decided to take a look at what, if anything, the store had to offer. Sure enough, buried in the area where kids stickers and books are kept and almost hidden to anyone not looking for them, I came across a small selection of packs. There were a couple of years worth of recent Score releases, some Panini Stickers and albums, and the obligatory 15-card mixed bag of base set cards, none of which really got me excited. I had never seen one of these before, but it immediately reminded me of some of the other mystery pack products I’ve come across over the years, mainly at Wal-Mart. With a price point of just a toonie, and with a promise of “Original Sealed Packs!”, “Presstine Repacks!” (based on the images on the outside of the box there are ten different options), and “Card Protectors!” (believe it or not I actually find that appealing), I decided to take a chance on one, if only to get a sense of what these things contained so I could know whether or not I should ever buy another one in the future. Here’s a look at what I got. 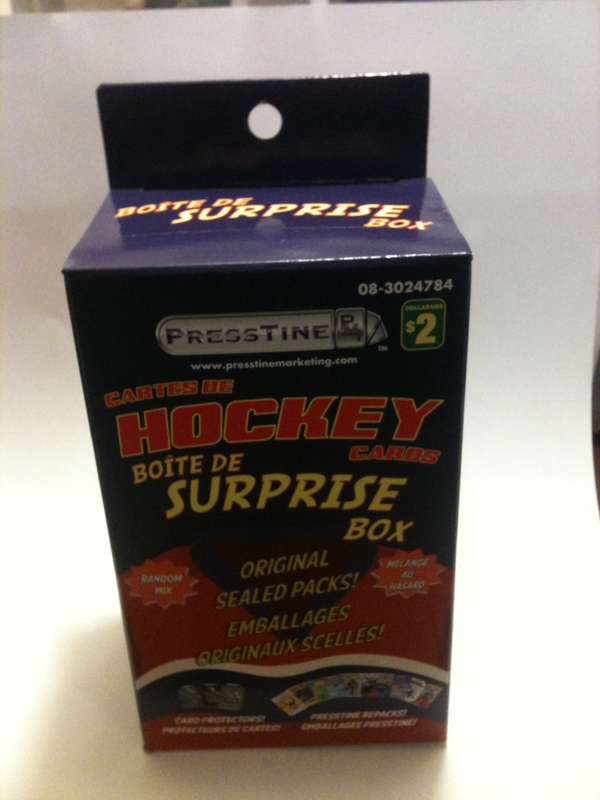 There were also three “Presstine Repacks” in the box, the first being an 8-card pack titled “The 90s”. Given the recycle-bin-bound quality of the first seven cars, the 1997-98 Donruss Preferred Cut to the Chase of Kevin Hatcher was a very pleasant surprise. Thankfully the company’s definition of “Superstar” wasn’t as loose as I feared and I ended up with an Evgeni Malkin 2010-11 Upper Deck Biography of a Season card amongst the group included in this pack. To finish things off, I had a “Premium Pack”, which apparently would entitle me to $5 in “book value” of cards. Really nothing to complain about here. A pair of inserts featuring a Vezina Trophy caliber goalie, a short print rookie card, and a parallel of a short print rookie card. In the end, I have to say that I was pretty happy with what my $2.26 (after taxes) got me. Obviously these things won’t allow collectors to score a big ebay pay day, but if you’re looking for a little fun these are certainly worth the minimal financial risk based on what I found in this box. 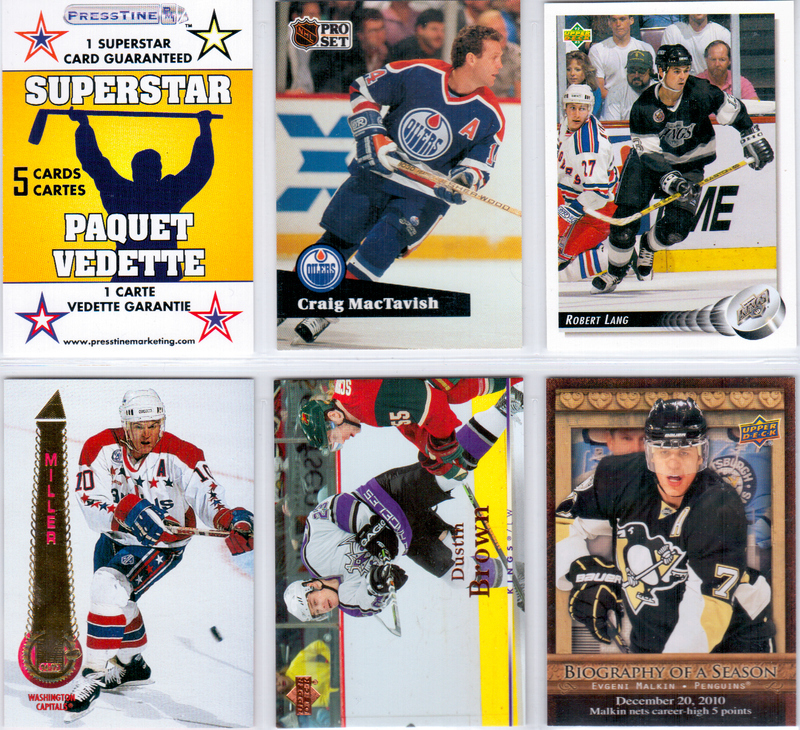 All of the cards you see above are available for trade or sale, so if you’re interested in any of them please feel free to post a comment, connect on Facebook and Twitter, or email me at bb_bros@hotmail.com. So far in 2013 I’ve been making some pretty decent progress on a number of my major collecting projects, particularly my 2008-09 Upper Deck Masterpieces Master Set project. One project that hasn’t seen any cards removed from the want list prior to today is my 2006-07 Upper Deck Artifacts Bronze Parallel /25 set. In today’s post, however, I’m able to cross a pair of cards off that have arrived over the last 10 days or so. I picked this one up for a measly $5.95 including shipping, which to me is an absolute bargain for a goalie who has become a perennial Vezina Trophy contender. It came with a price tag of $5.99 including shipping, which is a price I’m comfortable paying for a common from this set. When I did a quick search about his career I was surprised to learn that Thomas has actually played more than 80 games in the NHL since the 2005-06 season, including as recently as last year when he played 7 games for Florida, notching a total of 16 goals and 12 assists. 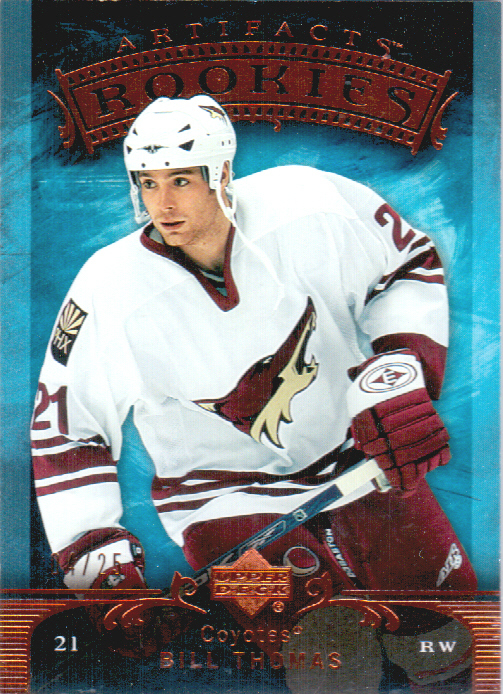 I had been expecting to read up on a guy who had a cup of coffee in the NHL and then faded into European league obscurity as so many players featured on NHL rookie cards do these days. 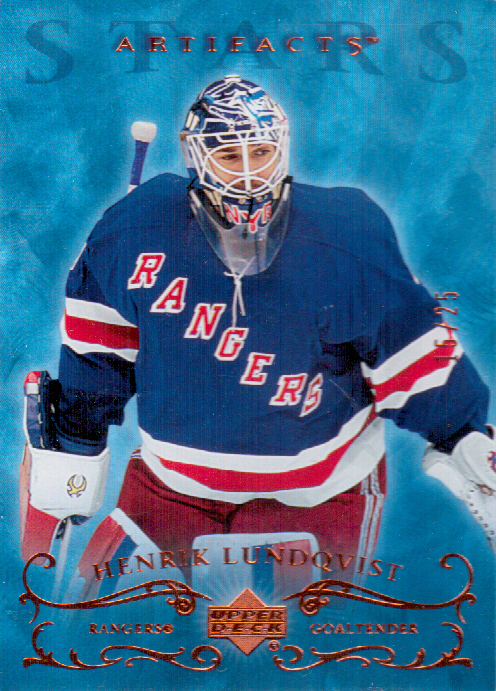 With that said, knowing that I got the Lundqvist for basically the same price as I feel comfortable paying for a common player, it only serves to increase my feeling that I got a bargain basement price on the first of these two pickups. With these two cards knocked off the list I am now up to a total of 91 cards acquired for this project, leaving me with 139 still left to track down. A daunting task to be sure, but what good is a major collecting project without some significant level of challenge involved? Please feel free to take a look at my want list and let me know if you have something that I need for this project or any of the others that I’m currently working on. Post a comment, connect on Facebook and Twitter, or email me at bb_bros@hotmail.com to get in touch and let me know what you’ve got and what you might be looking for yourself. My ultra-early morning has allowed me to get caught up on my emails and blog reading. It has also resulted in the first ever two-posts-in-one-day situation here on the blog (actually, it’s two posts in about an hour). Needless to say I was completely caught off guard. It’s not often that a company simply discontinues a customer loyalty program. Often they just modify it to their benefit, but they still offer some sort of incentive for people to buy from them. In typical ebay communications fashion they try to tell us that this was a “difficult decision”. I’m guessing the decision to stop allowing people to get free stuff wasn’t actually difficult at all, since it means more money in the company’s pockets (aka shareholders). The FAQ page is equally as pathetic in its rationale of why the program is ending, offering no real explanation whatsoever other than that after reviewing the program’s “effectiveness” the decision was made to end it. So was it ineffective in the that it didn’t draw enough new customers to the site to make it worth their while or was it too effective in that so many people were getting items for free that it was a drain on the company’s profits? Quite frankly, the program was never all that impressive to me in terms of the return I got from it. With all the buying I do from the site I don’t think I ever made enough purchases to even reach the $10 mark on a single certificate…and that’s per quarter, not per month! So to address their comment, I really can’t say I found it all that “rewarding” and I honestly can’t say that as a buyer I’m even going to notice it’s gone. As a seller though, I do have some concerns about this announcement. I realize ebay never had to offer this up to buyers in the first place, but the optics of introducing this program to its users then abruptly ending it entirely just aren’t good. Because of this I’m worried that this may drive people away from ebay itself, meaning its driving them away from my ebay store as well. 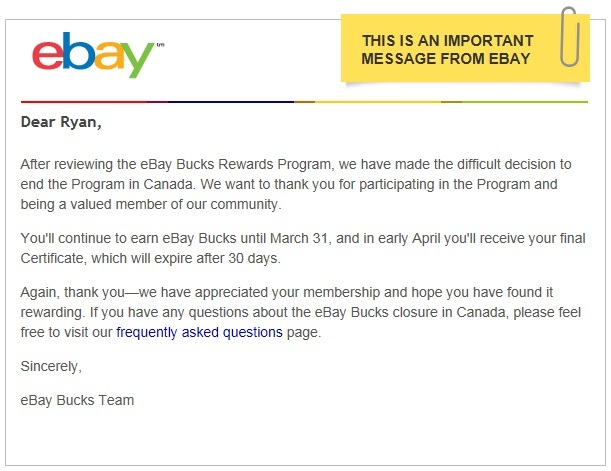 What are your thoughts on this move by ebay? Is the program something you valued or will you even notice that it’s gone? Will this make you take your collecting dollars elsewhere or will you stick with ebay either way? Let me know your thoughts by posting a comment, connecting on Facebook and Twitter, or emailing me at bb_bros@hotmail.com. My wife’s been getting up before 5am the last couple of days to join the morning rush down to Toronto while she attends a conference. Since I’m an early riser in the first place it makes it almost impossible to even think about getting back to sleep for what would only be about 20-30 more minutes of sleep. So here I sit, bleary eyed and knocking back what I’m sure will be the first of many cups of coffee today, hacking out another collection catch-up post. 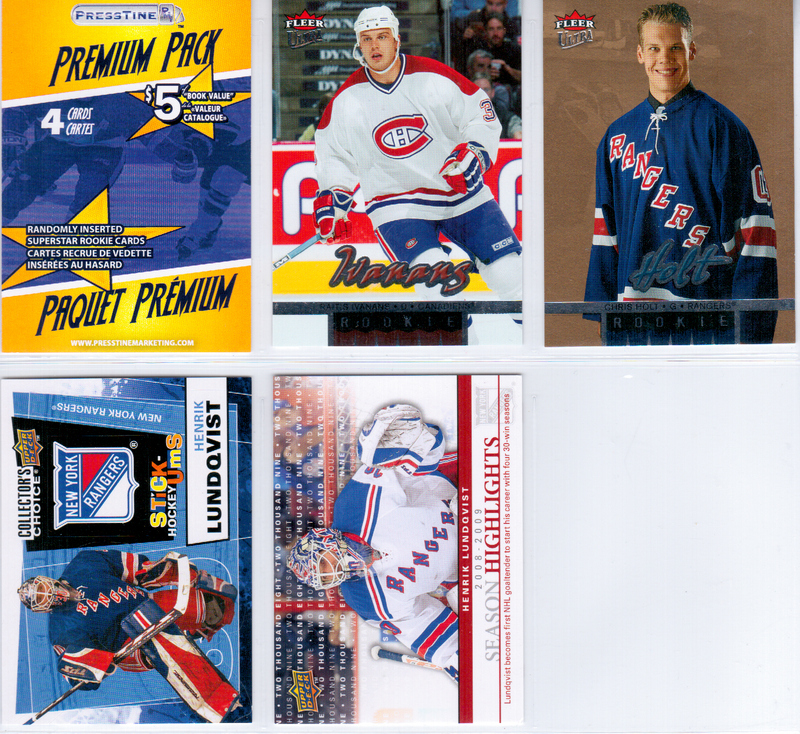 There’s a few of these to be posted over the next little while and today’s will once again focus on my 2008-09 Upper Deck Masterpieces Master Set project, a project I have clearly been having some luck with given that this is the fifth post about it in less than two months. This time around I’ve got progress to report in a couple of areas of the project. 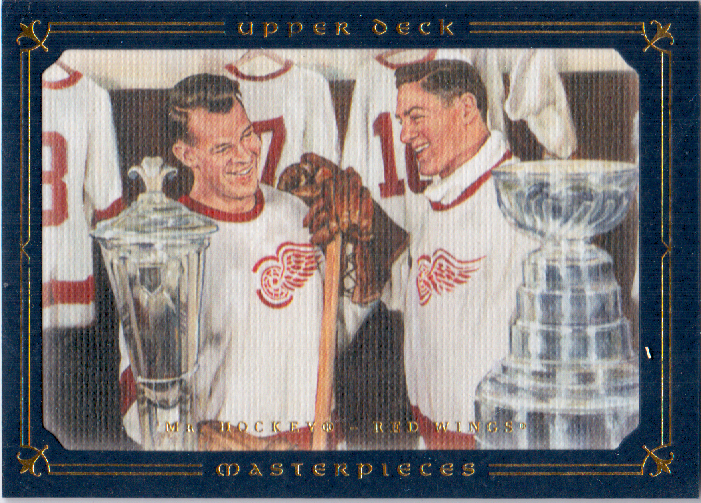 First up are a pair of the Blue Border /50 cards, each of which features Mr. Hockey, Gordie Howe. 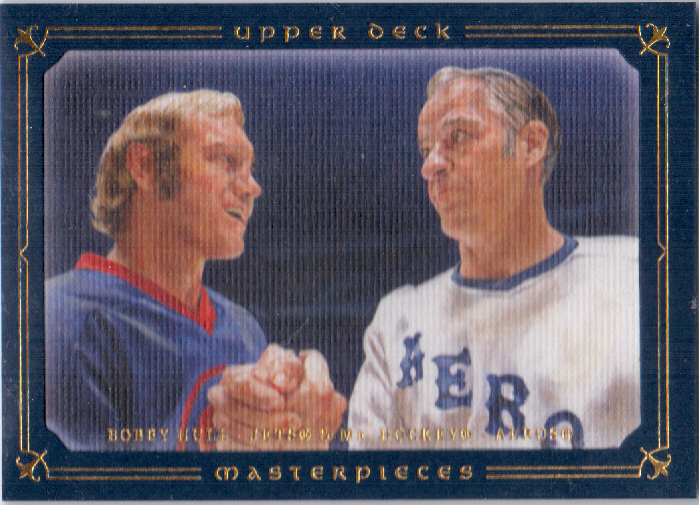 I find it interesting that the card with Bobby Hull clearly identifies each player, but on the second example there is no mention of the second player in the picture, despite the fact that the second player shares the spotlight evenly with Howe in the image. What’s worse is that even though I’m a lifelong Red Wings fan, I have no idea who that is with him. Given the size of the glove on his right hand I’m assuming it’s Terry Sawchuk, but I’m not certain. Can anyone confirm that for me? 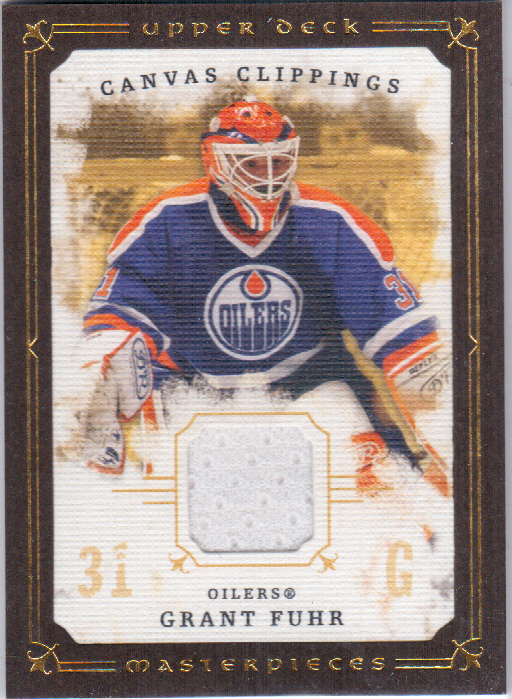 In addition to the two Blue Border cards (which push me past the two-thirds mark in terms of completion of that set), I also picked up a pair of Brown Border Canvas Clippings jersey cards recently in the form of Grant Fuhr and Patrick Roy, giving me 60 of the 67 cards from that set. The Roy features a maroon swatch of jersey which must have come from a Colorado Avalanche jersey. Unfortunately, jersey swatches that don’t match team colours are a regular occurrence in Masterpieces and is something I’d like to address once I’ve finished off the set by replacing specific examples of non-matching swatches with copies of the cards that do have a matching swatch, even if it has to be white. Once again there are more Masterpieces cards on their way to me via some recent ebay purchases, so further updates will follow. Until then though, please take a look at my want list and let me know if you have something that I need for this project or any of the others that I’m currently working on. You can post a comment, connect on Facebook and Twitter, or email me at bb_bros@hotmail.com to get in touch. This past weekend was a holiday long-weekend here in Ontario and despite the fact that I had plenty of free time to get caught up on the backlog of items I have on my hobby-related list, I woke up this morning feeling farther behind than I have in a long time. Today is my first blog post in more than a week. It’s also the first time that I have updated my want list on Sports Card Forum in exactly a month. I haven’t actively explored making any trades since early in January. There are piles of cards on my desk waiting to be organized and put away. There are stacks of sheets filled with cards waiting to be scanned, either to be listed in my ebay store or written about for this blog. There’s a 3200-count box that’s nearly full of cards that only require a quick update to their old listings in Turbo Lister and they could be on ebay bringing in the revenue I need to achieve my goal of a self-sufficient hobby. With just an hour or two a day that I can dedicate solely to my hobby it just seems like entirely too much to get through. I don’t know where to begin so I don’t even get started. That, in turn, leads to me getting frustrated at myself for falling further and further behind all that I’d like to get accomplished. But not that long ago I was doing all of this and more with not much more time to dedicate to my hobby than I currently have available. Perhaps it’s a question of motivation. Things seem to go in ebbs and flows for me with this hobby lately, with some times being extremely busy and others being extremely slow. My motivation for getting things done seems to follow suit, rather than remaining constant through it all and balancing things out. Perhaps it’s that I’ve lost my focus when it comes to allocating my hobby-focused time. Other things that I’m doing in my life increasingly seem to be creeping into what used to be my “hobby-only” time or taking the place of the occasional bonus-minutes I used to find to chip away at stuff. Regardless of the reasons, there has to be a way to get things back on track. Collecting is something I’ve done for the vast majority of my life and the micro-“business” and writing that have become extensions of my hobby interests are things that I remain passionate about. Getting annoyed at myself for not getting things done and then not getting things done because I feel like I’m too far behind has to stop. There may not be enough hours in a day to accomplish every last thing I feel like I need to do, but with a little rebalancing there must be away to get there eventually.